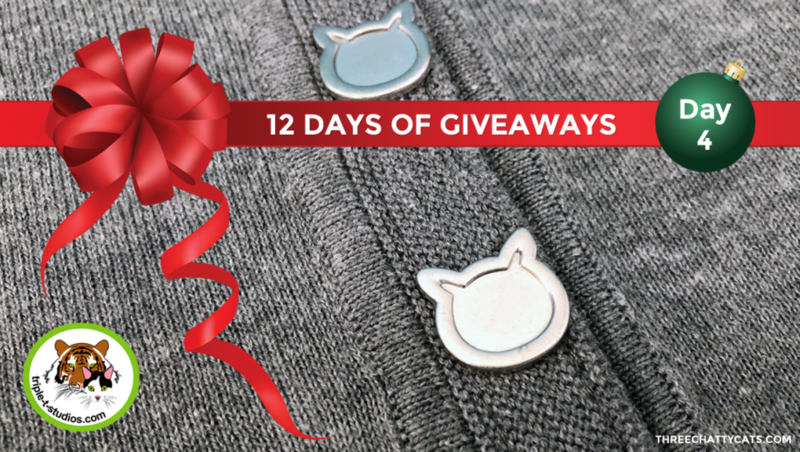 Day 4 of 12 Days of Giveaways features something for the cat lady from Triple T Studios! That’s right, today it’s about the cat ladies (sorry, cats). 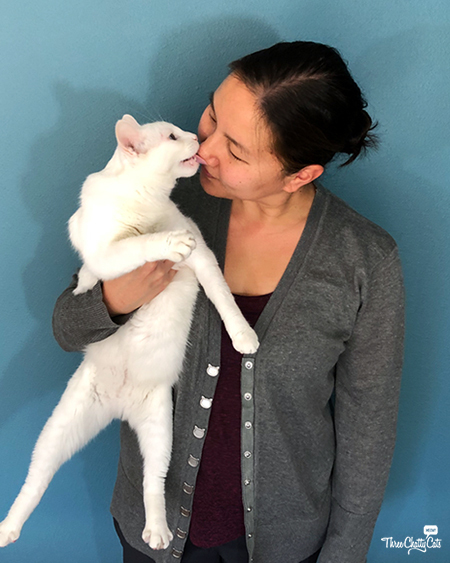 So, instead of checking in with the cats today, let’s see what I thought of the Cat Snap Cardigan from Triple T Studios. First, let me tell you about the cardigan I received before I give my thoughts on it. The Cat Snap Cardigan is available in four colors: Black, Gray, Violet and Mellow Rose (which they indicate is more of a salmon or peachy pink). The cardigan snaps are shaped like cat heads and very stylish. The website product description says: The Cat Snap Cardigan will be your go-to extra layer of cozy warmth and comfort when there is a chill in the air. This cardigan is updated with our signature cat head snaps adding feline finesse to a classic style. The Cat Snap Cardigan is currently available for $39.00 at triple-t-studios.com, but we have a discount code for 20% off (details below)! I live in Southern California and don’t require a jacket as often as many parts of the country. So, I believe I’ll get lots of use out of this adorable cardigan this winter in place of a jacket. And during the warmer months, it’ll be great in the evenings when I just need an extra layer of warmth. The first time I wore the cardigan out in public, I received several compliments on it! I usually wear a size medium in jackets, shirts, sweatshirts, etc. But because I like to be comfy and not feel restricted, I thought a large might be nice for this cardigan. I think it might run a tad on the small side, and I’m thankful that I ordered size large. You can find a complete size chart on their website to determine the best fit before ordering. Fair Warning: Human Photos Ahead! 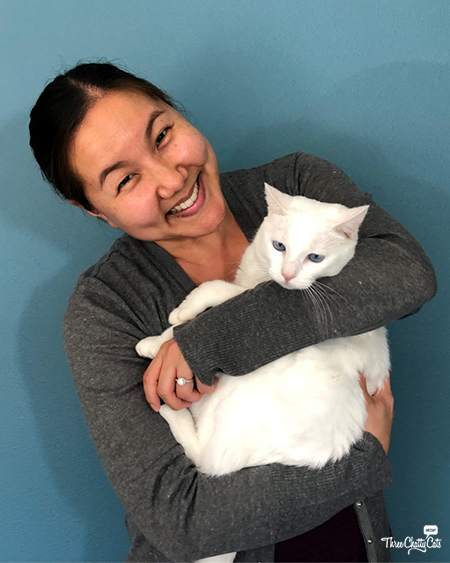 If you know anything about me (besides that I love cats), it’s that I hate being in photos. But when reviewing a cardigan for a human, I didn’t think it would be fair to make Sophie model it for you (although how cute would that have been?). But I did insist that Sophie be in the photos with me so you can focus on her instead of me. And really, these are more blooper shots than anything…because…well, Sophie (a.k.a. the goofball). Sophie: Mama, stop laughing! Don’t you know how to pose for a photo? Put me down, this is very embarrassing. I can’t be involved with your amateur modeling skills. Sophie: Actually, this cardigan does feel nice wrapped around mah furs. I may have to get one for myself. Do you think they come in cat size extra awesome? 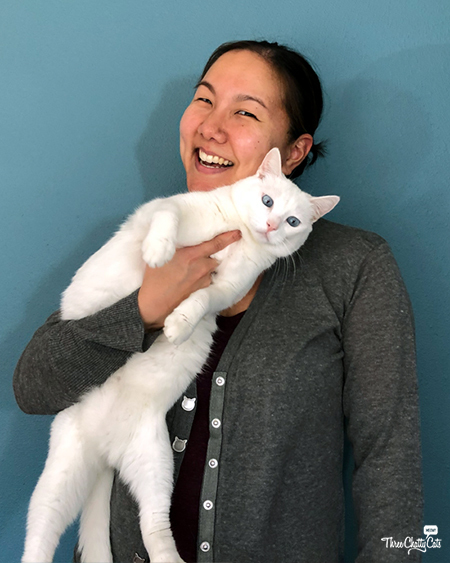 If you want to see what the Cat Snap Cardigan looks like on someone not holding a cat, head on over to the website. You can also see the different colors it comes in. Triple T Studios sells cat handbags, totes, apparel, jewelry and accessories. But did you know that they support big cat conservation projects around the globe? That’s right! A portion of profits goes to global conservation programs. Check out this video about Triple T Studios and The Tiniest Tiger to see how they got started. 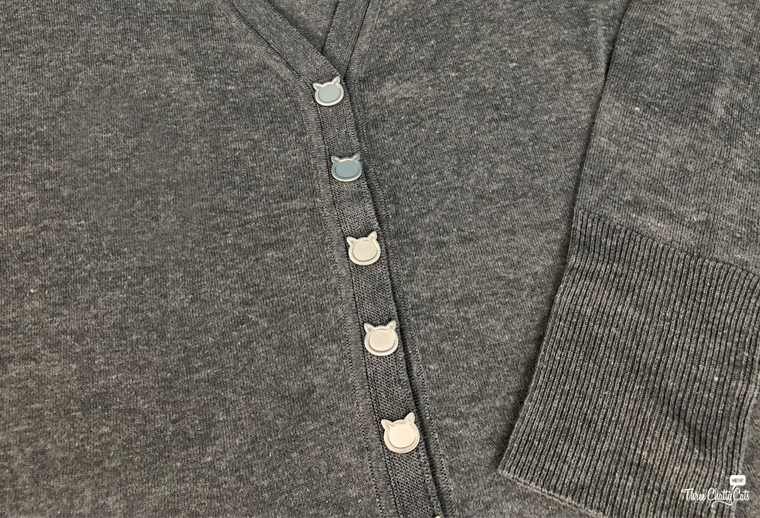 Triple T Studios is letting us give away one Cat Snap Cardigan to a lucky reader! The winner can choose the color and size. Simply enter a blog comment below and then enter the giveaway through Rafflecopter. And guess what? This giveaway is open to the U.S. and Canada (details below)! The giveaway is open to residents in the U.S. and Canada, 18+ years of age, except where prohibited by law. One winner will be selected randomly by Rafflecopter and contacted via email. The winner will have 48 hours to claim their prize. Failure to do so will result in forfeiture of the prize, and a new winner will be randomly selected by Rafflecopter. The giveaway closes on Sunday, December 9, 2018 at 5:00pm Pacific. The Cat Snap Cardigan would make a great present for any cat lady in your life – including yourself! And with four different colors, you’re sure to find one you like. Triple T Studios has been kind enough to offer readers 20% off the Cat Snap Cardigan! Simply enter code ChattyCats20 at checkout. Keep up-to-date with the latest from Triple T Studios on Facebook, Instagram and Twitter! Wouldn’t this Cat Snap Cardigan make an excellent addition to any cat lady wardrobe? Super cute cardigan! I wish I was Canadian, so I could enter Haha. Well now, that sure is cat lady classy cool! You look gorgeous in your pics! Not sure who looks better – you or Sophie! That is such a cute cardigan. I think the gray is very versatile. Very cool! Looking forward to the day you raffle off Sophie! I want to win that one! Beautiful cardigan! Taking meowdeling tips from Sophie, great idea!! LOVE, LOVE this cardigan – my kitties said I must get one for my sister NOW! I always take their advice. That cardigan looks even better when you’re holding a cat. I’d probably go for black. I like the violet its so pretty! I like the violet colour the most. I can see myself wearing this a lot. Sooo cute, my husband would love to call me his crazy cat lady wearing this! How cute are you and Sophie together?! After the photo shoot, has the cardigan changed color to a somewhat lighter gray with white fur interwoven in the knit? MOL If so, I’m sure you don’t mind at all! I would definitely wear this for work both in winter and summer, I’m always one of the coldest people in the office! Lovely cardigan and awesome photos! The gray is lovely. Nice cardigan, Rachel and Sophie. You both show the cardigan off nicely. It would be lovely and warm up here as one of our layers of clothing. I am SO getting one of these even if I don’t win! They will be awesome for my freezing office! I would go with the black! I would like gray, because Mickey’s fur would blend in, and Rufus’s orange fur always looks good with gray. The they pounce on each other, I always admire the gray and orange combination…. Thank you for having this giant give away celebration! you look ADORABLE in that cardigan!!!! Actually, I like ALL of the colors…..I probably would lean towards black though, but that could change! HUGE fan of this cardigan! My grey cats could even sleep on it and no one would notice! That is a lovely cardigan, and great modelling too. It is nice to see the face behind the blog! TW likes the violet, not that it would match anything she owns. MOL! You are a great model, Sophie. I hope they do sell one in size super awesome. Mellow Rose. I am more of a pink person – my cat is more grey (smile). I am in love with this cardigan! I’d like any color, but would most enjoy the yellow! I’m torn between the black and grey ones! It’s really cute and what a treat to see you and Sophie together. I would love the sweater in black – because I’m trying to look as cool as Rosie! We always love to see your beautiful smile, Rachel! But Sophie kind of stole the show, didn’t she? I think I would like the gray color, but all the colors are super! The mom really wants this cardigan so we want to win it for her. She likes the violet one. Love the grey or black. Super cute. I love the black. They are all really cute though! I like the gray, it won’t show the cat hair as much as the black :) Such cute photos. i like the grey the best. I love this so much. Oh, I like that. I’m heading over to their site right after I enter! This cardigan looks really cute and comfy! Thank you for this giveaway! Good luck everyone! I forgot to put I like the gray color the most. Beautiful-cat ladies deserve lots of gifts! I love the sweater! The Mellow Rose and the Violet are my favorites. I love Triple-T and have SEVERAL items from them. Love this cardigan too – it looks great on you! I think I’d probably choose grey because it just goes with EVERYTHING……Black would be pretty as well but I’d be covered in floof as Teddy’s coloring is LIGHT and I’m constantly picking him up!! Another nice giveaway. my bff would love this! I love Triple T. I just love cats and love cardigans. This would be very ideal for me if and when(thinking positive) I win. I would take a size Large in the grey cardigan. Gracey is the cutest CEO! Mom has seen one of the Triple T Studios totes in purr-son and says it was beautiful and high quality. She luvs the cardigan. Maybe I can win it for her and put it in her xmas stocking. Lovely cardigan! I like all the colors! We LOVE Triple T Studios! This cardigan is just fab. Sophie, you look so cute with your Mama, the photos are just fab. Super cute in gray! Although I`d love all the colors! Cute, maybe they can make some with cat heads for the pockets. I’d love they gray, actually I’d love the black but the cat hair!!! I love the gray color cardigan !! Tough choice!! I love them all. I tend to wear a lot of grey, so maybe grey would be my first choice followed by the rose! Violet is pretty but I prefer the gray..more neutral. I would love the gray colored cardigan. You gals look great! You had a great photographer.